For other uses, see Baiju (disambiguation). 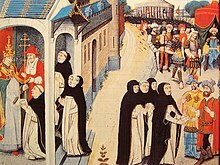 Ascelin of Lombardia receiving a letter from Pope Innocent IV (left), and remitting it to the Mongol general Baiju (right). Baycu Noyan was a Mongol commander in Persia, or present-day Iran (fl. 1230–1260, also known as Bayju Noyon or Baichu). He was appointed by Ögedei Khan to succeed Chormagan, and expand Mongol power further in that area. Baiju took over command in 1241 or 1242, and immediately moved against the Seljuk Sultanate of Rûm, shattering its power at the Battle of Köse Dağ in 1243. After this battle, the Sultanate became a vassal state of the Mongol empire and was forced to release David VII Ulu. He installed his protégé David Ulu to the throne of Georgia to oppose Queen Rusudan's decision. However, the Mongols had few forces in the area, and were content to maintain their vassals with punitive raids. Baiju led Mongol tumens to raid Syria in 1246. Despite his small successes there, his next two attempts to invade the Abbasid Caliphate in Iraq met less success in 1238-1246. At the end of the regency following Ögedei's death, however, Baiju was replaced by the new khan Güyük with Eljigidei in 1246, but Eljigidei and his entire family were purged in the accession of Möngke Khan in 1251 or 1252. Under Baiju in the 1240s and 1250s, the Mongols retained their power in what is roughly modern-day Iran, and tolerated the independence of the Sultanate, Georgia, and petty states in Iran as clients, interfering with dynastic succession and extracting tribute militarily as necessary. However, the Abbasids in Baghdad and the Assassins in the Elbruz mountains maintained their independence until the coming of Hülegü, Möngke's brother, in 1255. Baiju was supposedly reproached by Hulegu for failing to extend Mongol power further, and, indeed, was replaced by him as supreme commander as early as 1255, but served under him ably in further campaigns: against the Sultanate of Rum (to extract tribute and replace the sultan) in 1256, in the assault on Baghdad in 1258, and in the advance on Syria towards Egypt in 1259. It is unclear what happened to Baiju after that: when the Mongol force was heavily depleted by the departure of Hülegü in 1260, the force that remained was commanded by Kitbuqa. According to Rashid al-Din, Baiju was executed by Hülegü Khan due to failing to stop Golden Horde corps fleeing from Persia to Russia and Mamluks. His office was given to Chormagan's son, Shiremun.